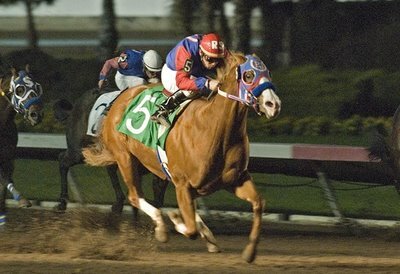 There are two main types of wager that we can make at the race track or from your Mobile Betting Device if you are connected with a Modern Bookmaker who employs a first rate Price Per Head Service which are usually located in a country like Costa Rica where wagering on Sports and Horses is legal and licensed. There are two main types of wagers placed on horses. Place: You collect if your horse finishes first or second. However, if your horse wins, you only collect the Place payout. The minimum wager is $2. Show: You collect if your horse finishes first, second or third, but you collect only the Show payout. The minimum wager is $2. Across The Board: You are wagering on a horse to Win, Place and Show. You receive one ticket for all three wagers. If your horse wins, you receive Win, Place and Show payouts. If your horse finishes second, you receive Place and Show payouts; and if your horse is third, you receive the Show payout. Because you are actually placing three wagers, the minimum wager is $6. Daily Double: To collect, you must select the winner of two races. For example, you must select the winner of the first race and the second race. Of course, you must place the wager before the first of your two races! Exacta: To collect, you must pick the horses that finish first and second in exact order. For example, if you play a 3-5 exacta, the #3 horse must Win and the #5 horse must Place (come in second) for you to collect. Exacta Box: Is made to guarantee the outcome of the first two finishers regardless of which horse wins. For example, if you box the #3 and #5 horses and either the #3 or the #5 horse wins and finishes second, you win. Trifecta: Is similar to an exacta, except you must pick the horses that finish first, second, and third in exact order. This is a challenging wager that often yields large dividends. Trifecta Box: Is made to guarantee the outcome of the first three finishers regardless of which horse wins. For example, if you box the #3, the #7 and #5 horses and either the #3 , #7 or the #5 horse wins, finishes second and third, you win. Pick 3: To collect, you must pick the winners of three consecutive races. And, of course, you must make your selections before the first race of your Pick 3 wager. An excellent wager that offers great excitement and opportunity to score Big! Superfecta: Is similar to an exacta and trifecta, except you must pick the horses that finish first, second, third and fourth in exact order. This is also a challenging wager that often yields dividends even larger than the trifecta. After you have made your winning wager of whatever type, the only question that remains is; Where do I go to collect my winnings? Best of Luck to All!